In Book 3 of On the Free Choice of the Will, Augustine tackles a question that has troubled many throughout history: if God is in control of everything, then wouldn’t that make God the author of sin? Most of us have felt the force behind this line of thought. There are Biblical passages that seem to indicate that God was somehow the cause of men’s sinful actions. For example, in Acts 4:27-28, it seems that Pilate and the Jewish leaders are described as only doing what God had “predestined” for them to do. And, again, in Genesis 50:20, Joseph seems to imply that God intended good out of the evils that Joseph’s brothers did. Augustine, or at least the translation I am using, can be difficult to understand. So just in case you didn’t grasp the argument, I’ll state it more clearly. If you decide that God was the cause of someone’s sin, then this person is not truly responsible for his sin. He was just doing what God planned. In doing this, you shift the responsibility for the sin from the person to God; indeed, you might be blaming God in order to clear the other person of blame. (“It’s not really Pilate’s fault that he ordered Jesus’s death; God made him do it.”) And in doing so, you are claiming that the person did not sin. He carried out an action that he was predestined to do. The blame is with God. But Augustine wants us to slow down. If we shift the blame to God, what are we blaming on God? You might say, “The person’s sin that God predestined him to do.” To which Augustine would reply, “What sin? Didn’t you conclude that since it was God’s fault and not the person’s fault, then the person didn’t sin?” And like a magician’s mind-bending card trick, we’ve lost track of something moments earlier we were certain was right before us–in plain sight! In shifting the blame for a person’s sinful action to God, the sin disappears. If the sin isn’t the person’s fault but is God’s fault, then the person is not a sinner. But that means that, though God is responsible for the action-previously-thought-to-be-sinful, the action is not now sinful. So God is not the author of sin: He’s just the author of something we thought was sinful but wasn’t. Every time I read this argument, I have the same reaction I have to many of Augustine’s arguments: it’s clever–clearly the result of a mind more fertile than most in human history–but something seems off with it. Again, it seems more like a clever card trick than a substantial argument that removes the philosophical difficulty. I have the lingering feeling that if I just carefully flip through the cards in the deck and check Augustine’s sleeves, the missing card will be discovered. This problem cannot be this easily solved. And I think I know why Augustine’s argument fails. I think we would all recognize that the general’s defense is not convincing. It should be rejected. But why? If God causes a person to sin, then that person did not sin. If the person does not sin, then God is not guilty of causing a person to sin (since the person didn’t actually sin). If God is not guilty of causing a person to sin, then he has done nothing wrong when causing the person to do the supposed sin. Therefore, if God is the cause of actions we initially regarded as sinful, then God is not guilty of anything sinful. But that does not mean that he hasn’t done anything that is not wrong. For the underlying, objective problem that would lead us to regard the person’s action as a sin (the harm caused to others, disrespecting the person’s value as a human, violating human rights, etc.) still remains. And surely it is wrong to cause someone else to do something with one of these qualities. We might not call what the person did sinful, so we would not accuse the one who caused the action of causing a sin. But we could still consider him sinful (or merely wrong) in causing the action – even though we would not properly say that he caused a sin. He sinned because he did something evil; he didn’t sin because he caused a sin. Likewise the general in the earlier illustration is guilty of causing an evil to be done; it’s not that he is guilty of making someone else guilty of doing evil (if you think that the soldier was not guilty of evil since he did not have the freedom not to do it). 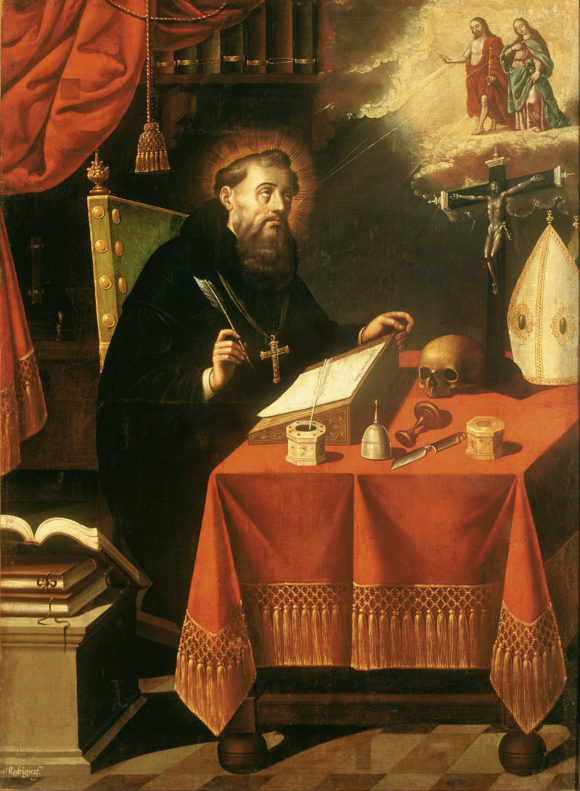 Augustine’s argument is certainly interesting, but it is not convincing. We should want to shield God from the claim that he is a sinner or causes sin. But Augustine’s way of avoiding that fails. It fails in an interesting way: it denies that God is the author of sin by making him a sinner. That just won’t work. The difficulties that surround human free will, moral responsibility, and God’s responsibility for evil still remain.